Gilbane recognizes the importance of constant collaboration and communications to ensure a successful project. Client Name: CBRE Group Inc.
Gilbane provided construction management services for the interior fit-out of the fifth floor for CardWorks Processing. The 30,000 SF project was extremely fast tracked to renovate the floor into CardWorks flagship office. 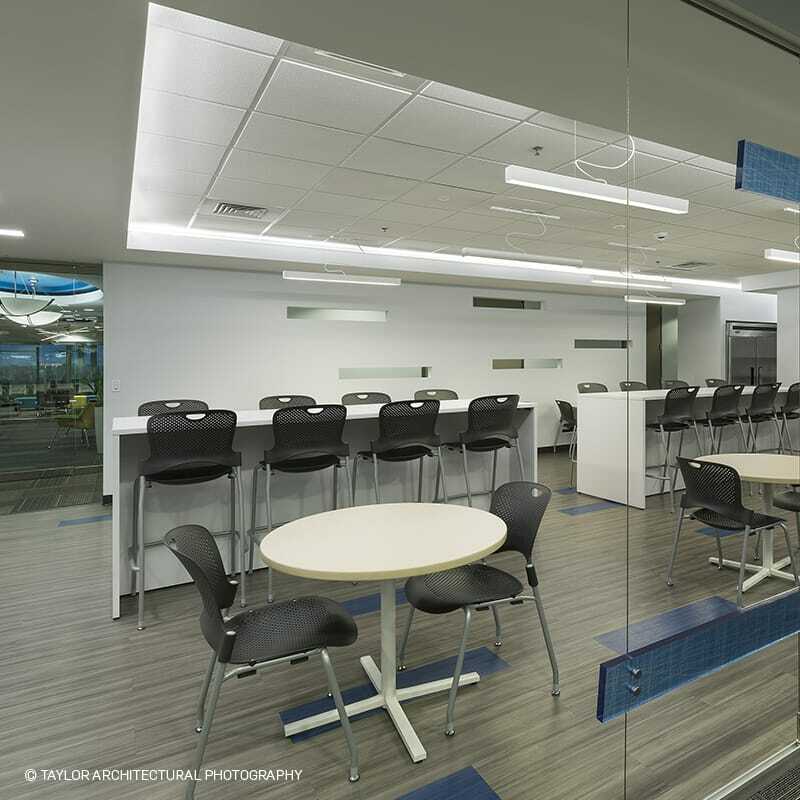 The space includes open office areas, meeting areas, conference rooms, breakrooms and a 2,500 SF Mission Critical Data Center to aid in their 24/7 operation. The project was completed in 5 phases, and in under three months, with the first phase being the office area. Phase 2-4 included completion of the data center and addition of a generator. 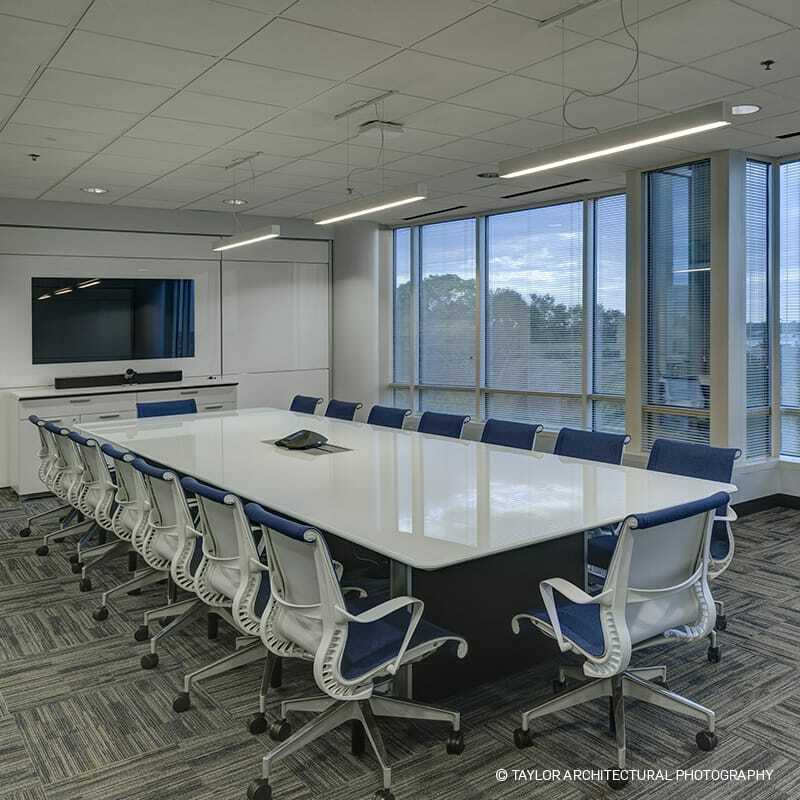 The Gilbane team paired with experienced trade partners to complete this project – relying on their understanding of the interiors renovations and their professionalism in delivering client excellence. Having the right trades on board from the start, minimized punch lists items at the end and kept the project on track to be delivered on time. The project included the complete gutting of the space and redesigning the entire interior. The team drove quality workmanship from everyone throughout the project. Facing the challenge of re-sequencing of the construction activities created a chaotic schedule and quality check order. To address this, the team and trade partners were diligent in keeping rolling completion lists rather than a punch list. We used BIM 360 to create the rolling completion lists rather than waiting until the end of the project. This saved much needed time for the team for this fast track project. Through careful pre-planning and detailed communications, the team delivered the transformational project with high end finishes and tons of natural light. 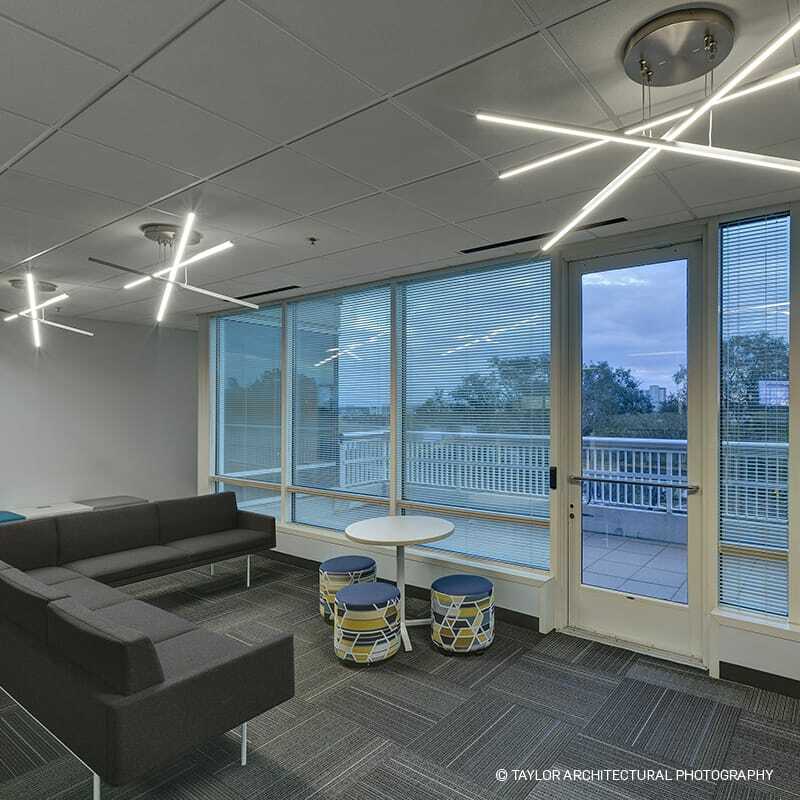 Function and aesthetics were equally important for this client to create an aesthetically pleasing and collaborative work space. The breakroom and meeting rooms were designed to be a space for employees to congregate and are suited for conversation. The layout and design allows for workplace flexibility which enables teams and individuals to shape space on the fly for enhanced interaction. Innovation is nurtured through informal, social, and creative interactions. 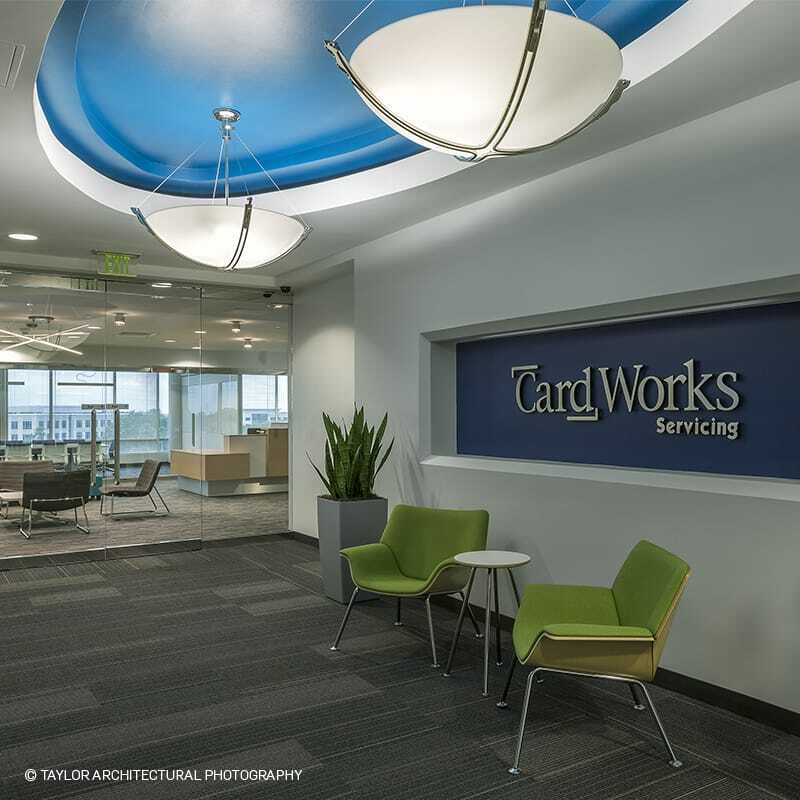 The intent of the design was to create a visually appealing atmosphere with soothing finishes which were selected to not only deliver and position the CardWorks brand and culture, but to also create a want to work space. While technology may be visible or invisible in these settings, it is integral to how teams work in the environment. In an open collaborative space, noise levels will be amplified, with more people sharing the same workspace. Sound masking technology was installed to limit the interruptions and noise from neighboring work spaces. Phase 1 of the project was extremely challenging with a very aggressive schedule. Gilbane was brought on board slightly later than normal in the process. We immediately recognized we would need to engage our trade partners earlier to assist in making some of the design decisions and brought in two of our trusted partners with experience in this type of product. At the same time, we began to evaluate Value Management opportunities. The team identified multiple alternative means and methods, resulting in roughly $150,000 in savings to give back to the project and aid in achieving the critical move in date.